As a longtime New Yorker now living happily in Hrad, my blog will celebrate what I call the 3Fs: Food, Fashion and Folklore! I seek to educate as well as entertain. My responsibility to readers is to make sure that things and places I recommend will not disappoint their cultured tastes. As a food lover, I am looking for a simple but elusive combination of good food, decent portions, reasonable prices, prompt and courteous service, a charming ambiance, and an interesting history. As a fashion blogger, I am looking for fascinating, authentic, unique pieces and whatever I can recommend that makes you look better. And in Folklore, in addition to anecdotes about interesting events and personalities, I cover tools, technology and craft traditions associated with popular culture, travel, architecture and more. Some time ago, the Moroccan embassy asked me to find a Czech fashion designer who could mount a joint fashion show together with famous Moroccan-Jewish designer Albert Oiknine to celebrate the annual tour of the Karlovy Vary Film Festival at the Pupp Hotel in Carlsbad. The Czech designers I contacted either declined or cancelled on me, so with just two days before the show, I still had nothing to offer. I remember how disappointed I felt that day and how I even considered skipping a social event planned for that evening. But as the hour approached, I remembered that sometimes the most important thing in life is just showing up. As Franz Liszt memorably put it, “Beware of missing chances; otherwise it may be altogether too late someday.” I put aside my wounded feelings and made my way to the event. By a great stroke of luck, I encountered there a beautiful woman (opera singer Alena Miro), who was wearing a classic but at the same time romantic dress. I asked whom was she wearing, and that’s how I first heard Camilla Solomon’s name. I went to Camilla’s magical show room the next day, and instantly fell in love with her fairy tale-beautiful, seductive dress designs. I asked her to put together 40 long dresses for the show taking place the next evening. She had only 20 available, but thinking quickly, she asked her loyal clients to pitch in for her success. She had to bring some of the dresses to the dry cleaner’s overnight, but she managed to pull it off. Camilla was a hit! It often seems as if Camilla is always on the move. Camilla has collaborated with powerful personalities and Czech powerhouses like Miss Czech Republic, Karlovy Vary Film Festival, and Preciosa. She prepares a new collection twice a year, and also gladly undertakes one-off commissions from her discerning clients. Camilla’s version of high fashion does not exclude a sense of timelessness. In one of our discussions, she told me that she does not want to create a dress that is like a single kiss that is never repeated. She does often not aim for the kind of flashiness that pleases runway paparazzi and magazine editors; her dresses are made to be worn by real women who want to make a glamorous but also a serious impression. In any case, she told me, when she adds a splash of color to her designs, her clients often ask her to make the same thing in black! Czech ladies are not the only ones who think that black is beautiful: as a New Yorker, many of my friends and I often made the same choice. 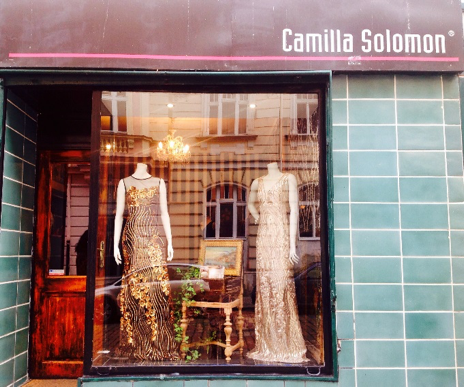 While I would probably never tell her so directly that I agree wholeheartedly with her Czech customers, I admire Camilla’s sense of vocation and I am proud of the small role I played in bringing her designs to a wider audience. Camilla, who is also of Jewish origin, got on famously with Oiknine. She came to Prague 15 years ago from Slovakia with only one suit, but with ample talent and the passion to fulfill her dream of becoming a fashion designer. She started in her own apartment and quickly built up a roster of faithful clients. She now owns a very cute boutique on Kozi Street (her home space she shares with eight cats.) Unlike some designers who exhaust their creative imaginations and budgets in an effort to secure a lease in a suitably situated Old Town square, Camilla is totally focused on her work. She has retained her sense of humility: for her, dress designing is all about meeting her customers’ needs, not feeding her own ego.